The name might be hard to say, but the flower is lovely to look at! Alstroemeria is originally native to South America. It also known as the Peruvian lily, or lily of the Incas, and it is quickly becoming a favourite flower for almost any occasion. These abundant blooms are actually members of the Amaryllis family, resembling miniature lilies. They are named after Swedish botanist Klas von Alstroemer, who collected seeds from this plant and many others during a trip to Spain in 1753. 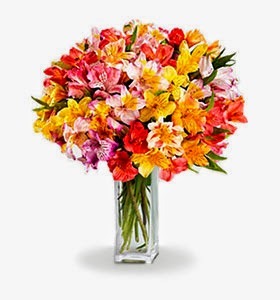 Alstroemeria packs a lot of impact with its vibrant yet delicate beauty. The abundant blooms have lovely, graceful veining and enjoy a longer vase life than do many other flowers. The flowers come in a wide variety of rich colours with unique markings. Consider the amazing Alstroemeria for your next bouquet, and wow them with something dazzling and unique!